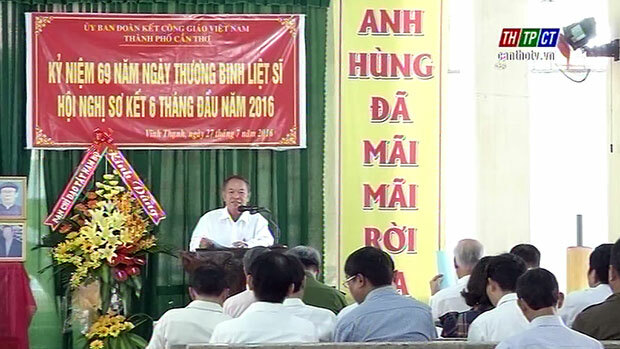 In the morning of July 27th, at An Bình church in Thạnh Tiến commune, Vĩnh Thạnh suburban district, Cần Thơ city’s Vietnam Catholic Followers’ Unity Commission organized the congress to review its tasks in 6 months of 2016 and the death anniversary of priests who have joined the fight for independence on the occasion of the 69th anniversary of war martyrs, invalids. Cần Thơ City’s Vietnam Catholic Solidarity Committee reviewed tasks in the first 6 months. Representatives of the steering board for the Southwestern region, military zone 9, the Party Committee, Fatherland Front committee, military command, religious affairs board under the home affairs department, party committee and people’s committee of Vĩnh Thạnh suburban district and representatives of friend religions came for attendance. In the first 6 months of the year, patriotic emulation movements of Catholic followers in Cần Thơ city have consisted of creative activities. In the field of charitable, social activities, Catholic followers have contributed VND 1 billion 400 million and 8 tonnes of rice to help the poor, the disabled. At the congress, Cần Thơ city Catholic followers’ unity commission organized to pay incense tribute at the dead priests while praying for peaceful nation and people on the occasion of the 69th war martyrs, invalids’ day./.